When submitting a job application, I got a jQuery error. I did not preserve my Chrome debugging tools logs, but I figured I should include it regardless. I don't want to apply unnecessary to test this theory. I'm not confident what's being targeted, but if it's any help - the post ended up using Stack Overflow's messaging system, which might be part of the issue for failing to attach a CV, as it doesn't look like it supports attachments to begin with. This is all theoretical, though. I'm not sure where or what went wrong, and I'd need to find a job I want to apply on before I can attempt reproducing it. Whether this matters I don't know - but it has to at least use StackOverflow for applying, and not redirect to their recruitment page. 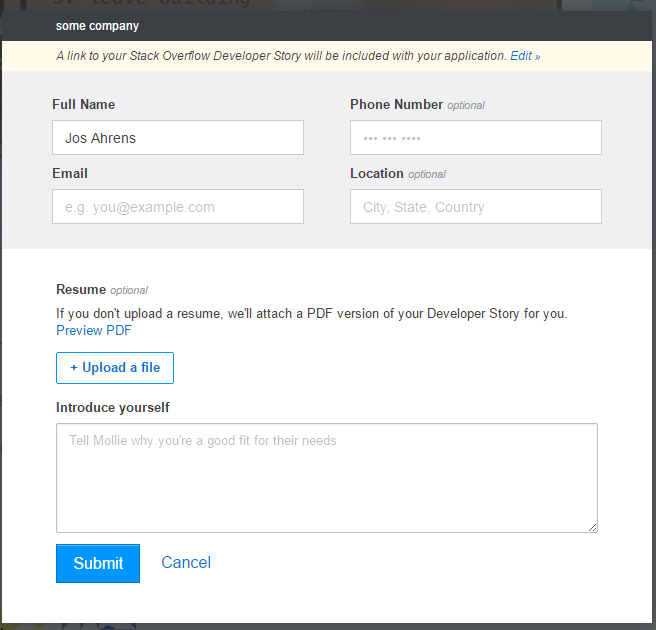 Click on "Apply", fill in the fields, leave CV blank to have StackOverflow upload your Developer Story in PDF format. Click "Submit" in the popup menu, an error should appear in your developer console. Not part of the bug, but it will be ambiguous whether your CV was attached, the UI does not indicate this, but in the comments section of this post someone explains that it was attached. No proxies/VPNs were in use. Thanks for your report. We had a file conveniently named google.analytics.so.js that actually took care of not breaking if Google Analytics wasn't loaded. Unfortunately, uBlock Origin was blocking it based on the filename, so our logic to handle an non-existent Google Analytics object couldn't kick in. I was able to verify that with a simple rename things went back to normal.